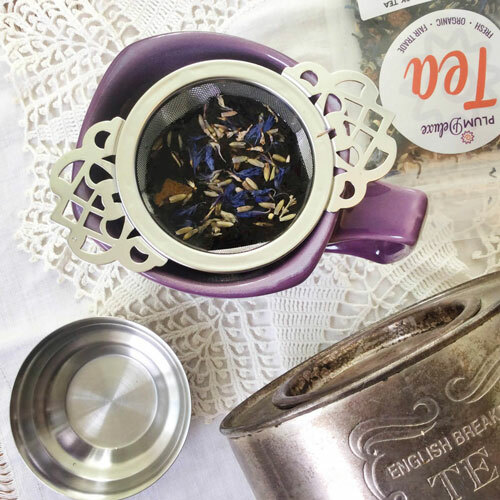 Earl Grey is one of the most popular tea flavors, and the perfect choice for any English tea party ideas. As Andy has reminded us, it was made famous by Star Trek’s Captain Picard. “Earl Grey. 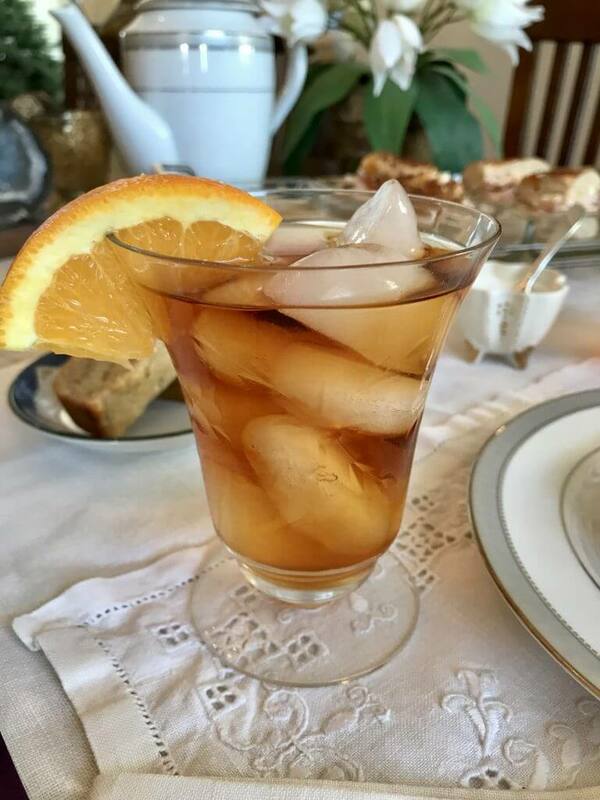 Hot!” To celebrate this bergamot-flavored black tea, I chose four must-do recipes to serve at this modern English tea party for two. 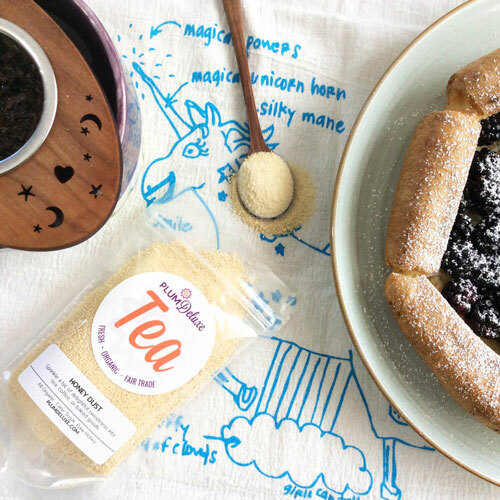 There’s a proper English tea, and then there’s sort-of-proper, the kind of tea setting where you get the basics down and toss out the more stringent rules to allow for a fun and relaxed environment. White placemats on white tablecloths are classic. I used some pretty blue plates I discovered in my cupboard, unique teacups, and special silverware. A “proper” English tea service has the 3 S’s: Seasonal breads or Scones, Sandwiches, and Sweets, arranged on a tri-level server. I skipped the three-tier server for a unique glass tray that I discovered discarded in an old barn on a friend’s farm. Recycle win! Our first must-have treat is an Earl Grey Cocktail. 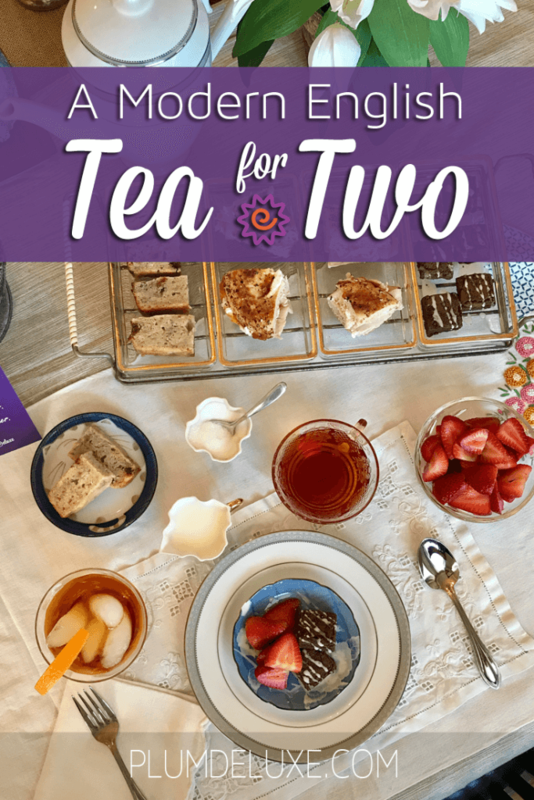 This small tea get-together is about relaxing with a friend and sharing some of each other’s lives in a safe space. Why not serve an adult beverage to relax the mind and body? Earl Grey tea makes a great cocktail base, in place of a more sugary option, and mixes well here with vodka, brandy, and Triple Sec. I came across this recipe for banana bread and knew it was the perfect thing for my tea service. 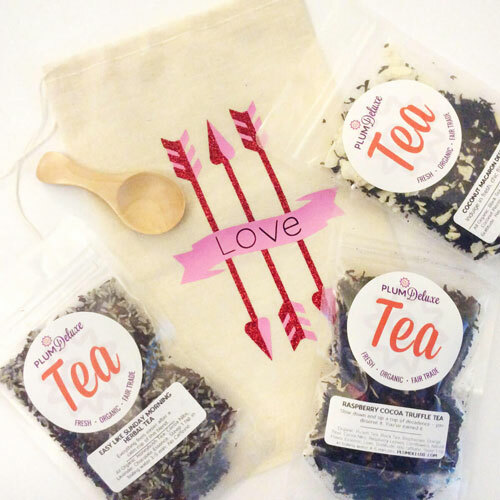 I couldn’t get over how delicious Earl Grey tea-soaked raisins sounded! I didn’t have Greek yogurt at home, so I substituted sour cream and it worked really well. This recipe can be made gluten free, or with all-purpose baking flour. 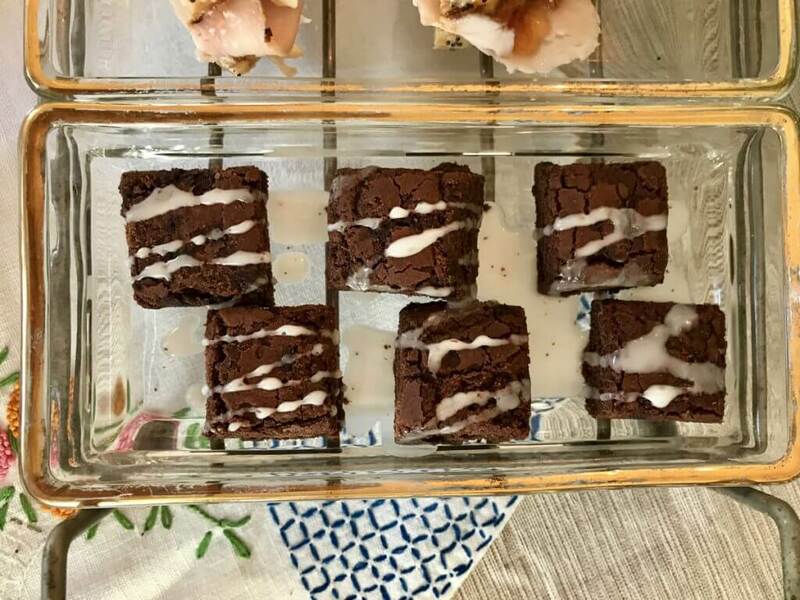 These fudgy brownies are a classic menu item to include in any British tea party ideas. They’re sweet and chocolatey with just a hint of citrusy bergamot flavor showing through. 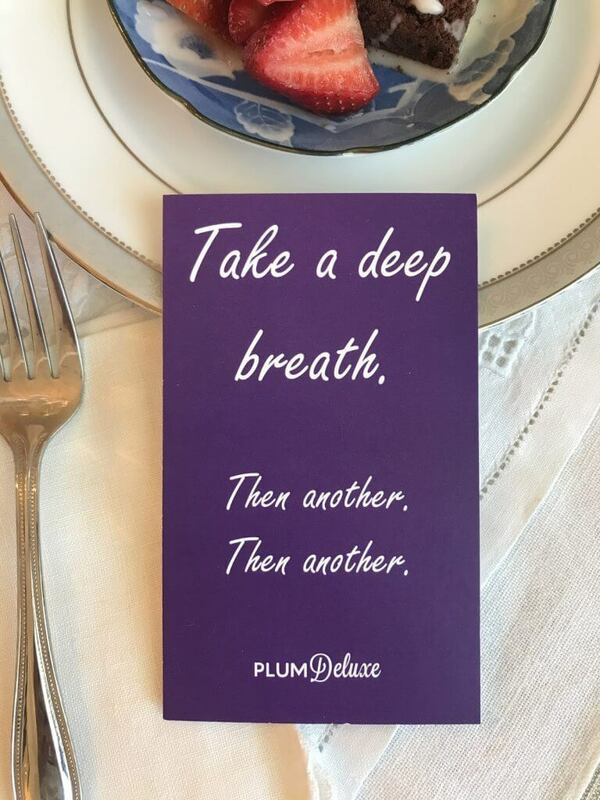 Plum Deluxe’s Mindful Morning blend uses Ceylon Black tea and blends in a pinch of vanilla, blue cornflowers for flavor and color, the traditional bergamot oil, and finally a hint of orange peels to add an extra citrus note. I added a twist to the glaze that I think really compliments this menu. As you’ll read on, our next must-have treat is Earl Grey Soaked Strawberries. I soaked my strawberries in sugar and Gratitude Blend tea overnight. Then, I used the sweet juice from the fruit for the brownie drizzle, making it a Strawberry Earl Grey Drizzle. Deeee-licious! Because I wanted something with a little color, and strawberries seemed like a very nice compliment to brownies, I was inspired by the strawberries from this Eton Mess recipe and made them as a side dish and brownie garnish. Prepare the tea and the strawberries. 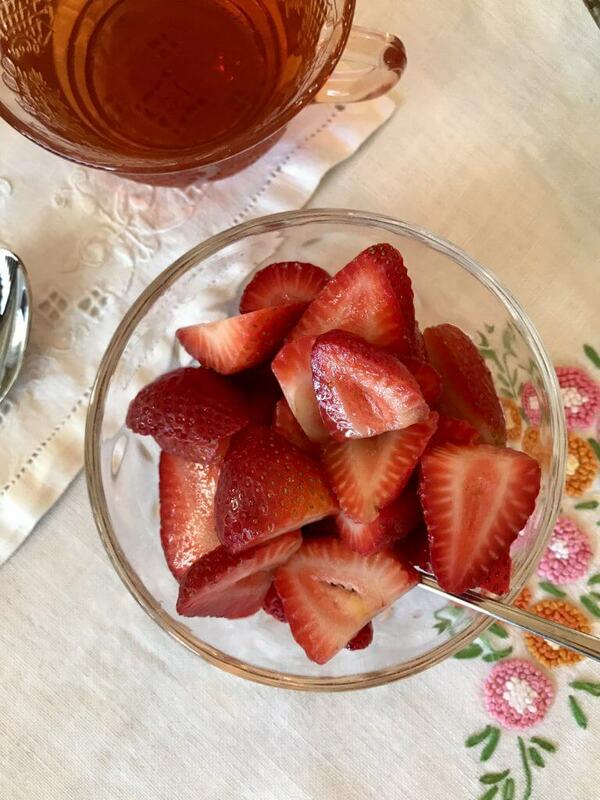 Place the sliced strawberries, prepared tea, and sugar in a bowl and mix gently. Cover and refrigerate overnight. The next day, place two cups of powdered sugar in a medium size bowl. Measure 1/4 cup liquid from the soaked strawberries and pour into the powdered sugar. Mix well until smooth. To thin out the drizzle, add more liquid. 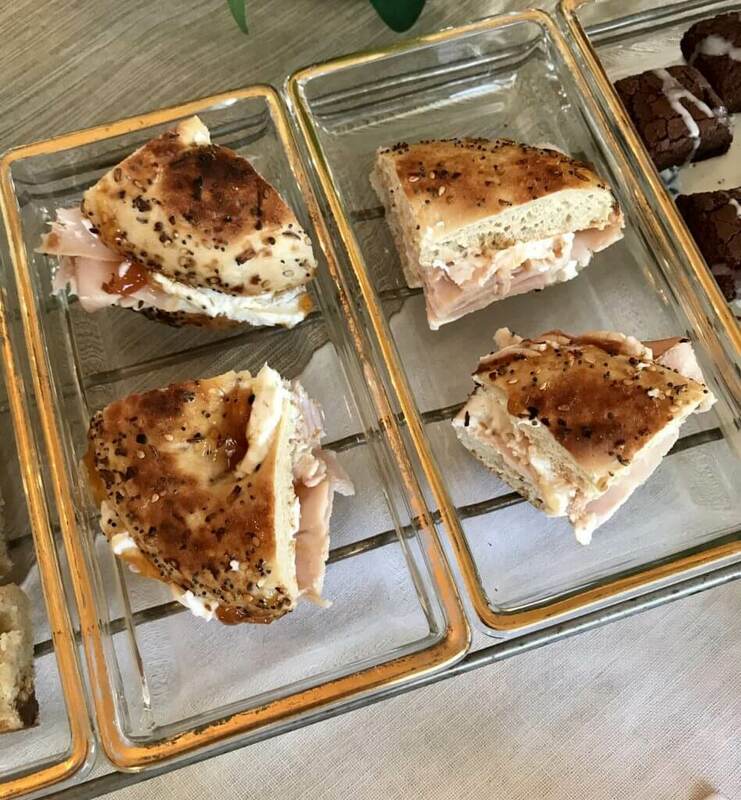 While I really packed in a lot of Earl Grey to the other items in this menu, my savory sandwiches are simply a creation from what I had around the house. Get creative with what you have on hand. 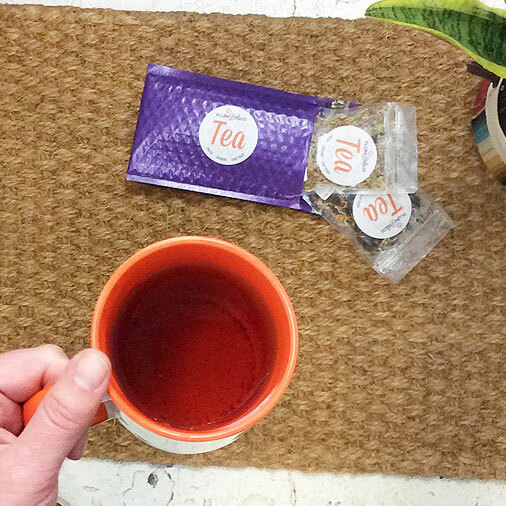 If you just have crackers and cheese, or toast and jam, that’s perfectly suitable for this twosome tea. Spread each toasted side of the bagel with cream cheese. Top with apricot jam. Layer one or two slices of turkey on top of the jam. Put the halves together and carefully slice into four pieces. Spending time with a friend for tea is a wonderful way to affirm and support each other, while enjoying a delicious meal. Share with each other your successes and struggles. Do away with the “stiff upper lip” for a few moments, and practice vulnerability.